The following is a list of the winners of the prizes that the Cornish Institute of Engineers has handed out. The William Thomas Memorial Prize was created in honour of one of the founders of the Cornish Institute of Mining, Mechanical and Metallurgy, which later became the Cornish Institute of Engineers. Mr Thomas was a former Head of Mining and Surveying at the Camborne School of Mines who sadly passed in 1931. A brief history of the prize can be found on this linked page – A Brief History of the William Thomas Memorial Prize. The prize, judged by members of the council of the CIE, was for the presentation of a formal paper before the Institute on a topic directly related to the mining industry. The supporting paper should be less than 2,500 words and the presentation no longer than 30 minutes. The winner recieved a Certificate and a £50 cash prize. Presented to the Institute by Wests Ltd (mineral processing equipment manufacturers) of Manchester in 1971. It was originally to be awarded for the best paper presented in Mineral Technology during the General Meetings of the Institute in any session. The regulations were modified to include any paper in Mining or Mineral Engineering given at either General Meetings or at the Annual Symposium, for consideration for this award but there were few applicants. 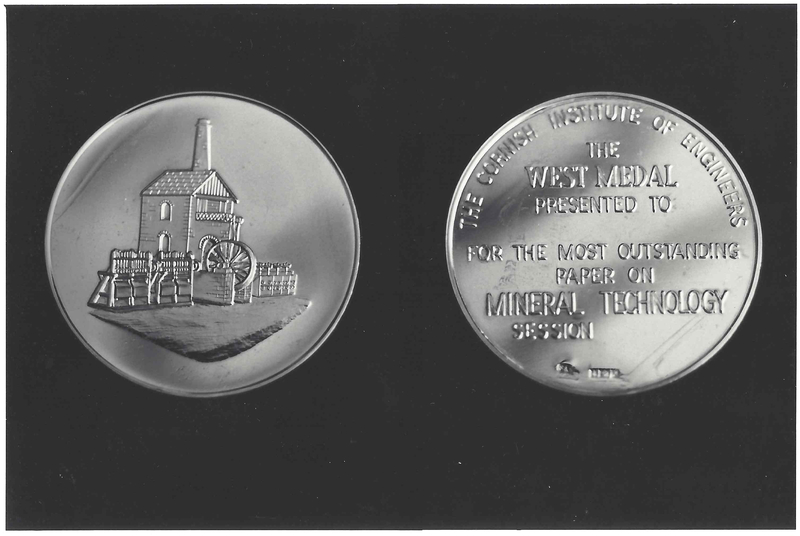 As far as can be ascertained the medal was awarded only once, to a paper by Dr. Osborne on “Marine Mining Problems of Ore Dressing” and once to Mr. J.H. Trounson on an unknown date. The remaining 21 medals lie in a safe deposit, but there are plans to present two to the Camborne School of Mines Museum. In 1972 Wheeler Critall Berry Ltd offered a medal and a £30 cash prize for papers initially on Electrical heating or ventilation, but subsequently widened to Electrical Energy or Instrumentation. There are no definitive records of the medal ever being presented. After his death in 1987 a memorial prize fund of £1830 was raised and endowed as a separate fund to be admnistered by the CIE and its Treasurer. In later years, this separate fund was amalgamated into the general endowed funds of the Institute and the prize combined with the William Thomas Prize. In 1990 the first award of £200 for the ‘Best student on an MSc (Mining) course’ was presented at the discretion of the staff at CSM.